Rise of a floater class: Behavioral adjustments by breeding Bald Eagles in a population approaching saturation. The Bald Eagle (Haliaeetus luecocephalus) population within the Chesapeake Bay has been growing rapidly for more than 40 years and is now approaching saturation. As the population reaches capacity, density-dependent mechanisms are expected to constrain reproductive options for birds of recruitment age, leading to the formation and expansion of a floater class. 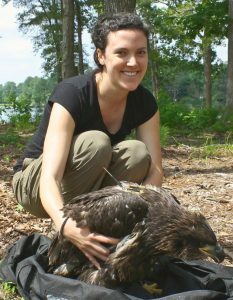 Negative feedback from these non-breeding, non-territorial adults has been shown to impact reproductive success of breeders in raptor species, providing a behavioral mechanism that slows population growth. However, little is known about the nature of interactions between floaters and established breeders during the reproductive period. Despite their presence in many populations and species, floaters remain an enigmatic aspect of population biology. We estimated the growth of the floater pool from 1990 to 2013 using reproductive data from aerial surveys and a closed BIDE model. We assessed long-term changes in breeder nest guarding patterns from 1994 – 2002 compared to 2013 to gauge the response of breeding pairs to increasing floater numbers. We used reproductive survey data (2006 – 2013) to identify the period during development when Bald Eagle broods are most at risk of failure to determine when intrusion poses the greatest threat to nest success. During observation sessions conducted in the 2012 and 2013 breeding seasons, we quantified intruder pressure at Bald Eagle nests, characterized the behaviors involved in conspecific encounters, and examined nest guarding behaviors of breeders. We found that nearly 100% of newly mature birds were recruited annually into the breeding population in the early 1990’s, but by 2011, less than 1 in 5 birds became breeders in their first year after attaining adult plumage. In concert with the decline in the assimilation of new breeders, the floater pool has increased over 5-fold since 1990 with an average doubling time of 2.8 years. We identified the first two to three weeks after hatching as the critical period for Bald Eagle nest success in the lower Chesapeake Bay, with the probability of nest failure steadily decreasing from 27% for 1-week-old broods to 7% of for broods beyond the three-week threshold. The average territorial intrusion rate during the reproductive period was 0.28 ± 0.32 intrusions/hr. Juvenile intrusions occurred closer to the nest than adult intrusions, but breeders showed higher response rates toward adult intruders. Breeders responded to intruders more frequently and more aggressively when in the presence of their mates. Nests in the posthatching stage were guarded significantly more often than during pre-laying or incubation periods. Aerial surveys indicated that the frequency of nest guarding by the second adult during the critical period has doubled from 1994 – 2002 to 2013. These findings suggest that floater pressure on breeding pairs is increasing as the population approaches saturation and that pairs are responding with behavioral adjustments.